The race starts from the recreation ground field in the small but busy village of Shrewton, close to Stonehenge. 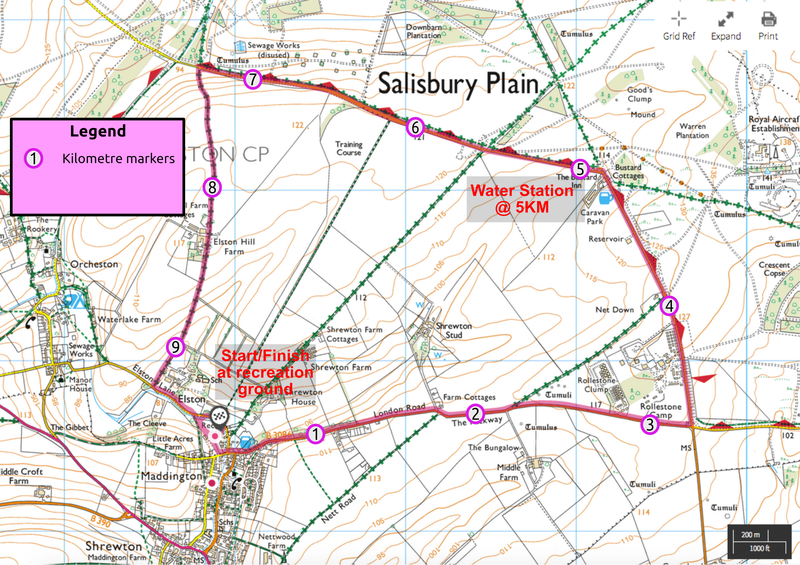 The runners head east along London Road towards Larkhill before turning left and heading out towards Salisbury Plain. Reaching the site of the former Bustard Inn, the route turns left for a 3.5km stretch along tarmac roads which afford stunning, expansive vistas over the plain. A short 150m incline tests the legs, the effort being rewarded with a 2.5km gently downhill stretch through quiet country lanes to the finish back at the recreation ground. The race is open to runners of all abilities and also forms Race #3 in the Wiltshire Road Race League. Shrewton Running Club can offer local runners support in preparing for this race. Please come along to one of our training runs or contact us. All finishers will receive a totally custom designed medal. These have been specially designed for this event and as such totally unique. You will be able to arrive on the day and pick up your race number and timing chip on the day of the race. Collection will be open between 08:30 and 09:30 on the day. Registration must be completed 30 minutes prior to the start time. If you are late, you will not be able to race. Please follow signage and marshals who will direct you to the parking area(s). Please car share where ever possible. Shrewton is a small village with narrow roads and lanes and we want to be friendly to the residents. Please only park in the designated car parks and not on the streets of the village. Shrewton Running Club will not be held liable for any parking infringements. Photographs will be available on Flickr for download soon after the event. Further details and link to follow. Presentations will take place at approximately 11:15am, any categories which are not won by this time will be presented shortly after. Results will be available shortly after the event and uploaded to our timing provider's website and Shrewton Running Club website. If you’d like to suscribe to email updates please register your interest with us. We will notify you a few days before entries open. Entries welcome from 15+ years of age. You should ensure that you train your body for endurance road running events and build up your stamina. This will enhance your overall fitness. A combination of strengthened joints and also fitness will aid in your successful completion of this event and assist with your recovery after the event. As you will be running for a long period of time, you should ensure that you train for the event by undertaking some longer running sessions. We also recommend that you trial your race nutrition prior to race day. Please be polite to all marshals on course, all pedestrians and other road users. Should you withdraw from the event for any reason, please alert one of the event staff and return your racing bib to them. Follow the highway code at all times.